Download Hour1 Download Hour2 Before we continue our title piece, another 9-11 related piece from 2009. Author/film makers Bob Coen and Eric Nadler describe their researches into Amerithrax and the multi-billion dollar germ "defense" warfare industry. In our second hour, we continue with The New Pearl Harbor on the Pentagon and Shanksville events. We conclude with two 9/11 Commission members calling foul. We begin with a piece of the 9/11 puzzle not covered by Massimo Mazzucco's film:- the 2001 Anthrax Attacks carried out just after 9/11, which served to facilitate the passing of the Patriot Act by promoting terror, among the general public and among legislators. The White House staff were not taken by surprise - they started taking Cipro (the anti-anthrax antibiotic) a week before the attacks were launched. As we hear, there is in practice more or less no difference between (legal) defensive bio weapons research and (illegal) offensive bio weapons research -- and it tends to be carried out in highly secure facilities anyway, often under the auspices of the intelligence services behind a veil of 'national secrecy'. The South African truth and reconciliation committee gave us a rare glimpse - of extensive US/UK/South African collaboration and of plans to develop race specific bioweapons, for example, to lower the fertility of the black South African population. As well as examining some international patterns of bioweapons research, Bob Coen and Eric Nadler also focus their account on the 2001 Amerithrax case -- which lead to tens of billions of dollars in profits for bioweapons research companies. If he [Bruce Ivins] is the one who sent the letter, I do not believe in any way, shape or manner that he is the only person involved in this attack on Congress and the American people. I do not believe that at all. I believe there are others involved, either as accessories before or accessories after the fact. I believe that there are others out there, I believe there are others who could be charged with murder. I just want you to know how I feel about it, as one of the people who was aimed at in the attack. 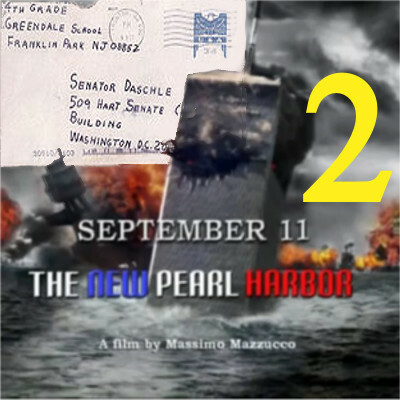 In our second hour, we continue with part 2 of Massimo Mazzucco's hard hitting New Pearl Harbor, which begins by looking at the Pentagon. It hints at answers, but generally sticks to difficult questions unanswered by the official narrative. Why, if there are 85 video tapes of the 757 hitting the pentagon, have only 2 been released - at least one of which has been badly photoshopped to obscure whatever hit the pentagon? Why does the report claim that the fuselage went the furthest into the pentagon, when this is the softest part of the plane? Why was no plane wreckage visible, no remains of passengers or luggage? Do you get tired of people asserting that "If there was a conspiracy, then someone would have talked", or "they had a commission and that vindicated the official version"? As we hear, Max Cleland resigned and stated that "the White House was playing cover up" while his replacement, Bob Kerry stated, after going along with the commission that 9/11 was "a 30 year conspiracy". Thanks to Olivier for pointing me to the video, thanks to Active Ingredients for providing the Amerithrax piece, and hearty congratulations to WeAreChangeLA helping Bob Kerry to come clean. This page was last modified on 27 January 2014, at 05:13.